Angie W. Yin, MSAOM, LAc., & OMD. was born and raised in a family of medical doctors in Chengdu, China. In her childhood, she spent most of her daycare time at her father’s private integrative clinic where she was exposed to the nature of both Western medicine and Chinese herbal remedy practice. Whenever she got sick as a child, Angie was healed by taking prescriptions from her father, a third generation MD in China. Growing up in such a profound family background in medicine has later inspired her desire of becoming an acupuncturist and Chinese herbology practitioner. Angie moved to the U.S. in her teenage years. She earned her BA from the University of Washington where she studied Business Administration and Fine Art in oil painting and her dual Master of Science in Acupuncture and Oriental Medicine from Bastyr University. She relates her expertise and sets of skills in fine art painting with her acupuncture profession as she considers that both share aesthetic quality, manual dexterity, stability and concentration in terms of practice. 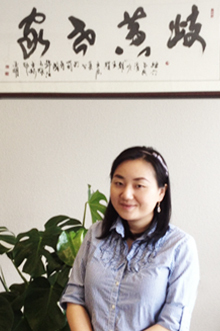 Angie is fluent in English, Mandarin and Sichuanese (Chinese dialect). She is very open and respectful to the essence of diverse cultures as her patient population comes from a variety of ethnicities. Bastyr Center for Natural Health, Seattle, WA. International Clinic at Harborview Medical Center, Seattle, WA. Angie is a preferred provider, frequently referred and recommended by other medical professionals in Bellevue and Greater Seattle. Throughout her clinical experience with acupuncture and Chinese medicine, Angie specifically targets pain management and gynecology, as well as general practice with a holistic approach, using the least invasive modalities. She has seen a wide variety of clinic cases and provided her patients with safe and professional care. Angie applies firm and gentle acupuncture techniques to ease needle-sensitive patients, which makes treatments a pleasure. Her patients range from ages 16 to 85 years old. Angie has been a part of the volunteer acupuncture team for Bastyr University at the Seattle Annual Marathon where she works one-on-one with athletes and runners by helping them to restore energy and relieve muscular soreness and fatigue. Angie encourages her patients to take a proactive role in their own health care by achieving well-being in both spiritual and physical states. She dedicates her professional career towards this concept as she profoundly believes the power of a positive attitude has a great contribution towards one’s health, which she’d love to share and pass on to her patients. In her spare time, Angie enriches her life with hobbies, such as: reading Chinese classic medical texts and literature, creative writing, mathematics, sketching and painting, art exhibitions, interior design, fashion design, photography, dancing, road trips, hiking and walking her German shepherd dog, Husky. Angie W. Yin, MSAOM, LAc., & OMD.